This photograph shows a framed display board labeled, "Wallace, the Metropolis of Western Kansas. Directory of the thoroughly reliable business houses." 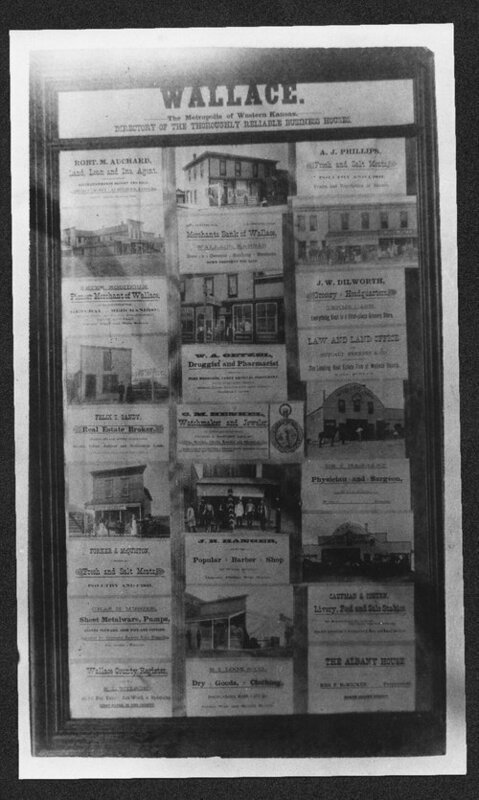 There are 17 businesses advertised on the display, and many of the advertisement also contain photographs of the business buildings. Businesses listed include: Robert M. Auchard, Land, Loan and Insurance Agent; Peter Robidoux, Pioneer Merchant of Wallace; Felix T. Gandy, Real Estate Broker; Forker and McQuiston, Fresh and Salt Meats; Charles H. Musser, Sheet Metalware, Pumps, Stoves, Tinware, Iron pipe and fitting; Wallace County Register; Merchants Bank of Wallace; W. A. Oetzer, Druggist and Pharmacist; C. M. Henkel, Watchmaker and Jeweler; J. R. Hanger, Popular Barber Shop; B. I. Look and Company, Dry Goods and Clothing; A. J. Phillips, Fresh and Salt Meats; J. W. Dilworth, Grocery Headquarters; Law and Land Office; Dr. J. Haggart, Physician and Surgeon; Caufman and Coburn, Livery, Feed, and Sale Stables; and The Albany House. Holding Institution: Homer Eiler, 1930.